1. Could you tell me a little about your academic and professional life? I’m in the fourth year of the Telecommunications technical high school education at CEFET/RJ. Although I’m very engaged with science and technology, I’m also very interested in the humanities, greatly due to my four years of elementary school at Pedro II. This wide range interests is what led me to pursue my higher education at the United States. 2. How was “Harvard” and what did you do there? 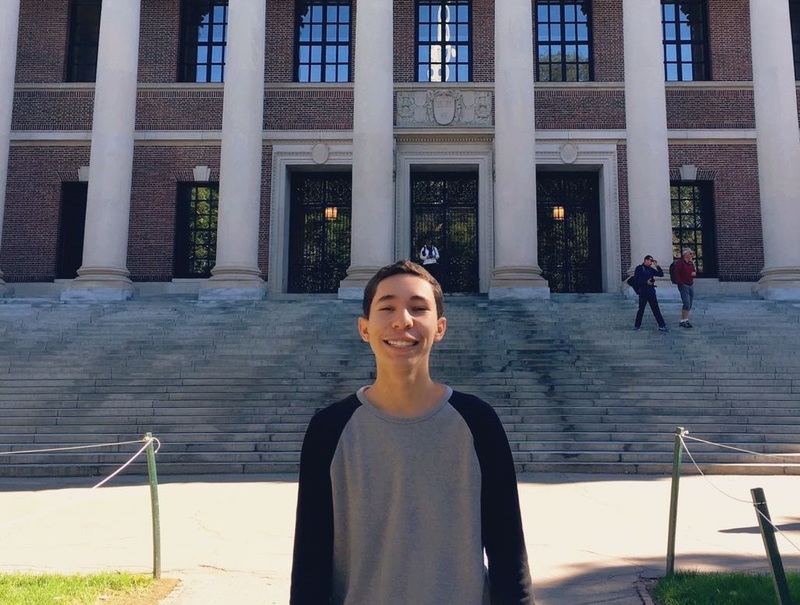 Harvard is everything you can believe and much more. Although I only spent one week on the campus, it was one the most enriching and important experiences of my life. 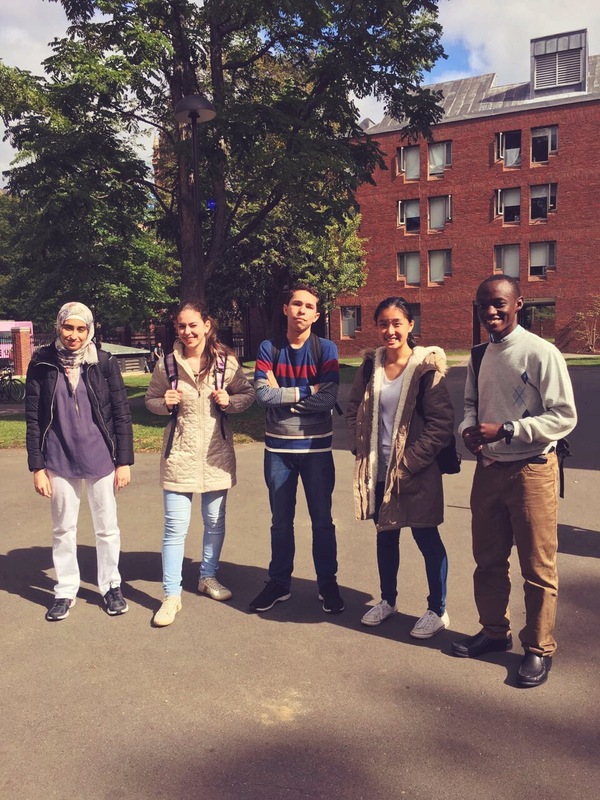 I went to Harvard after winning the Village to Raise a Child contest, which selects and nurtures five young entrepreneurs from across the globe. During this one week, I lectured in the Ignite Innovation Summit, attended classes from professors such as Michael Sandel and David Malan, and participated in several entrepreneurship events at MIT and around Boston. 3. What are your projects to the Brazilian education? I started working with education because I believe this is the most powerful method to fight our unequal society. 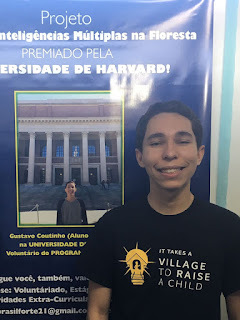 Two years ago, I was part of the team that translated, adapted and brought Harvard University’s CS50 (Introduction to Computer Science) to Rio de Janeiro. Our team taught and lectured around 200 students at the Biblioteca Parque Estadual for 6 months. Last year, I started another project. 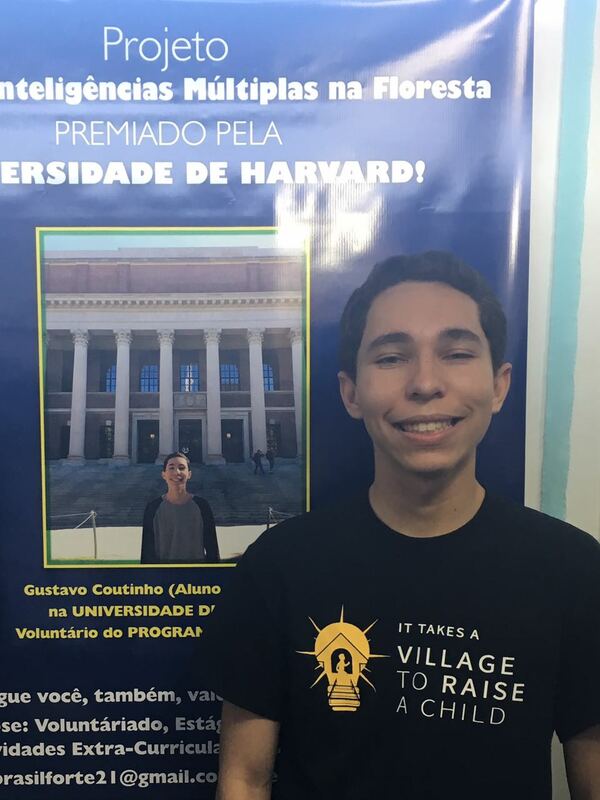 In partnership with the OSCIP Brasil Forte, we have been implementing Harvard Professor Howard Gardner’s Multiple Intelligences Theory in the Brazilian education. We are primarily working at the Alto da Boa Vista region with several different initiatives. 4. How to be a volunteer for you? Being a volunteer is a very rewarding experience. Every single person on Earth is a potential volunteer. Some discover this power inside of them sooner, others later; however, all of them agree that being able to help and positively affect other people’s lives is one of the best experiences possible in life. 5. Do you have a message to pass to other students that want to apply to international universities or change the world? When you decide to apply to international universities, you have to be confident in yourself. Believe you are capable. Other than that, do well at school and engage yourself with extracurricular activities you actually enjoy doing, whether it is scientific research or social projects. In addition, it is essential that you find mentoring programs that help you during the application process. Although it is possible to do the entire process alone, it is always easier when you have someone who understand the process thoroughly and you can trust and rely.